Ships in the night. – Dirty wet dog , boats and sailing. Fowey is still a working commercial port but with really only 1 trade aside from the local fishing boats : the coasters that come in and out here serve the china clay works and load up just opposite where i put alongside. The combination of ships, tugs and pilot boats close up makes for a bit of noise that is added-to by lorries coming to offload in at most hours easily from 6 and right through the day. It also makes for a bit of congestion as the ships, small ones as they are clearly need the centre of the river and a big turning circle just off the port. My early morning call this morning was i think a signal blast of morse ‘A’ and the beat of at least one big propeller and its tug moving off the berth. I used to be dead nervous to be that close to what i thought of as ‘big’ ships but of course they aren’t that big…just a lot larger than yachts…then going back several years i had to make a trip through the kiel canal which isn’t very wide at all and spent all day passing ships within a few yards. As long as they are doing their thing down the centre all is well. 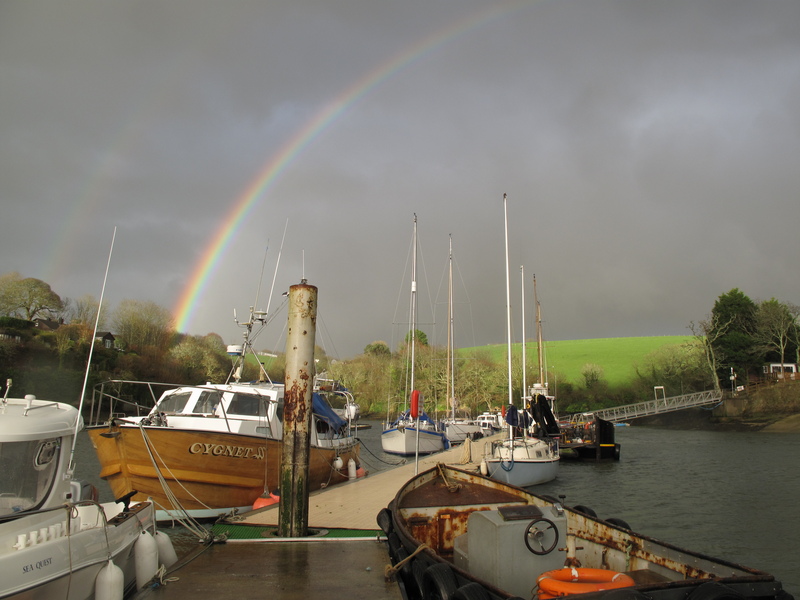 I haven’t been further up the river yet as conditions were cold enough , wet enough and so windy at times that sheltering in the boat was the only option…some spectacular rainbows formed in the heavy showers too.